American Rebecca Soni has won gold in the women's 200-meter breaststroke at the World Swimming Championships. Her training partner, Russia’s Yulia Efimova, finished second. Tuesday's 100-meter breaststroke winner Soni led from start to finish and stopped the clock at 2 minutes and 21.47 seconds. Nineteen- year-old Yulya Efimova of Russia won the silver with the magic time of 2 minutes and 22.22 seconds. Canada's Martha McCabe finished third in 2:24.81 to take bronze. Her compatriot, defending champion and world record holder Annamay Pierse, finished eighth. Also on Friday, Olympic Champs the United States’ men’s 4x200-meter freestyle relay team, anchored by Ryan Lochte, won gold, leaving France and China in their wake. 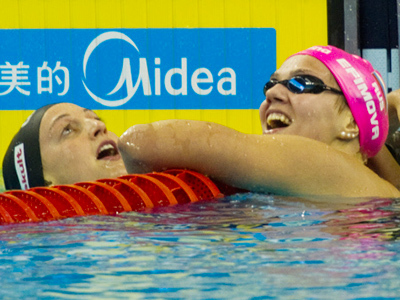 Jeanette Ottesen of Denmark and Aleksandra Herasimenia shared gold in the women's 100-meter freestyle. While Daniel Gyurta of Hungary overtook Olympic Champion Kosuke Kitajima on the final lap to win gold in the men’s 200-meter breaststroke.